Manitoba Parks is once again offering staggered dates for camping reservations to help elevate the backlog on opening day. Reservations for Cabins, Yurts, Group use areas and Birds Hill campsite will open on March 18th at 7 a.m. C.D.T. Reservations for Winnipeg Beach, Betula Lake, Big Whiteshell, Brereton Lake, Caddy Lake, Falcon Beach, Falcon Lakeshore, Nutimik Lake, Opapiskaw, Otter Falls, West Hawk Lake and White Lake campgrounds open April the 1st at 7 a.m. C.D.T. 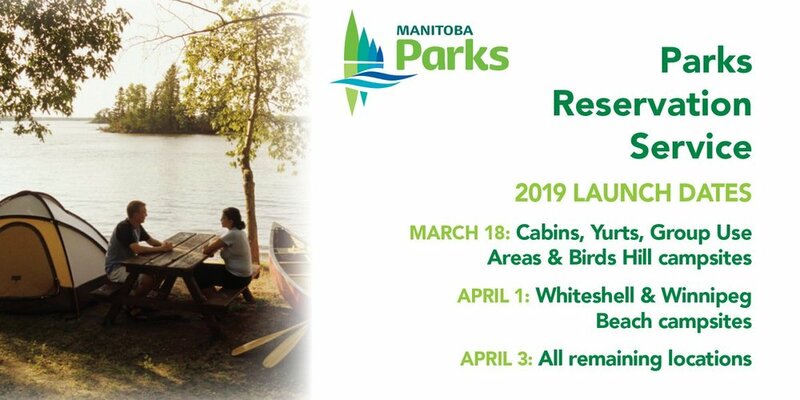 Remaining provincial park campgrounds will open on April 3rd at 7 a.m.
Register by phoning 204-948-3333 (in Winnipeg) or 1-888-482-2267 (toll free), or book online. Don't forget about the Park Explorer Pass ($40) which serves as your entry vehicle permit into Manitoba’s provincial parks. It is valid from May 1, 2018 until April 30, 2019 and can also be purchased at provincial park offices. Download the Campers Guide as a .PDF to learn more before making your reservation and be sure to check out some of Manitoba's most popular parks. The Sunset Shores Nightly sites at St. Malo campground have been renumbered. Kiche Manitou new campground office at Spruce Woods will be open at a new location in the day use area of the park. Asessippi new campground office will be open. Grand Beach Washroom/Shower renovations to be complete in the spring 2019. Grand Beach: Please be aware that due to ongoing construction of the Grand Beach sewage treatment lagoon expansion project and it?s proximity to the campground, there may elevated noise levels as well as heavy equipment traffic during the day. It is anticipated that construction will be ongoing over the summer. Asessippi campers should note that a temporary and/or ongoing road closure may come into effect during the 2019 camping season if road slumping issues worsen due to high amounts of precipitation. Should a closure come into effect, park visitors would be required to follow a detour to enter the park. The detour would also increase the distance between the boat launch area and campground. Big Whiteshell, this will mean one of the existing washroom buildings will be unavailable, and access to sites D1, D2 and D3 will be affected. There may be elevated construction noise levels during the day. It is anticipated that construction will be ongoing over the summer. Paint Lake, no sites should be affected directly but traffic to bays 2, 3, 4 and 5 could be impacted. There may be elevated construction noise levels in bays 2 and 4 which are nearest to the building location during the day. It is anticipated that construction will be ongoing over the summer. Spot the Stripes ? Prevent the Spread: Help protect Manitoba?s lakes and rivers from the spread of Aquatic Invasive Species. Always clean, drain, dry all items when you remove them from the water. Learn more at:Manitoba.ca/stopthespread. Cannabis: In Manitoba, it is prohibited to smoke or vape non-medical cannabis in all public places. The smoking or vaping of cannabis, medical or non-medical, is prohibited at all campsites within government-operated provincial park facilities (this includes campsites, overflow sites, group-use areas, backcountry campsites, cabin and yurt sites). The smoking and vaping of cannabis inside a tent, camper trailer or motor home located on a campsite is also prohibited. No smoking or vaping of any kind is allowed inside a cabin or yurt. For more information on cannabis use in Manitoba, please see Manitoba.ca/cannabis. Stay connected with Manitoba Parks by following them on Twitter at @MBGovParks. Banner image is of Spruce Woods Provincial Park, provided by Manitoba Parks.